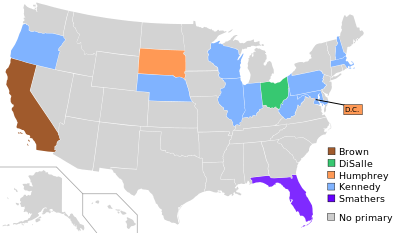 The 1960 Democratic presidential primaries were the selection process by which voters of the Democratic Party chose its nominee for President of the United States in the 1960 U.S. presidential election. Senator John F. Kennedy of Massachusetts was selected as the nominee through a series of primary elections and caucuses culminating in the 1960 Democratic National Convention held from July 11 to July 15, 1960, in Los Angeles, California. Recalling the experience of 1928 Catholic Democratic presidential nominee Al Smith, many wondered if anti-Catholic prejudice would affect Kennedy's chances of winning the nomination and the election in November. To prove his vote-getting ability, Kennedy challenged Minnesota Senator Hubert Humphrey, a liberal, in the Wisconsin primary. Although Kennedy defeated Humphrey in Wisconsin, the fact that his margin of victory came mostly from heavily Catholic areas left many party bosses unconvinced of Kennedy's appeal to non-Catholic voters. Kennedy next faced Humphrey in the heavily Protestant state of West Virginia, where anti-Catholic bigotry was said to be widespread. Humphrey's campaign was low on money and could not compete with the well-organized, well-financed Kennedy team. Kennedy's attractive sisters and brothers combed the state looking for votes, leading Humphrey to complain that he "felt like an independent merchant running against a chain store." On primary day, Kennedy crushed Humphrey with over 60% of the vote. Humphrey withdrew from the race and Kennedy had gained the victory he needed to prove to the party's bosses that a Catholic could win in a non-Catholic state. In the months leading up to the Democratic Convention Kennedy traveled around the nation persuading delegates from various states to support him. However, as the Convention opened, Kennedy was still a few dozen votes short of victory. Although Kennedy won primaries by comfortable margin, his main opponent, Senate Majority Leader Lyndon B. Johnson, who did not participate in primaries, had a very strong base in party establishment and gained many delegates. Johnson did not join any primary, but was a write-in. Kennedy announced Lyndon B. Johnson as his choice of running-mate on the afternoon following his nomination. Johnson was nominated by acclamation that evening. ^ Schlesinger, Arthur M. (2002) . Robert Kennedy and His Times. New York: Houghton Mifflin Company. p. 195. ISBN 0-618-21928-5. ^ White, Theodore (1961). The Making of the President 1960. Giant Cardinal. p. 212. ^ Lawrence, W. H. (July 15, 1960). "Johnson is Nominated for Vice President; Kennedy Picks Him to Placate the South". The New York Times. Retrieved 11 September 2016. This page was last edited on 18 February 2019, at 19:32 (UTC).